The new Nissan Juke Nismo, first shown at the 2012 Paris motor show, is set to become the first of many Nismo-badged products in Europe. Nismo is set become Nissan's performance brand in much the same way as AMG for Mercedes-Benz and M-division for BMW. The UK-developed Juke Nismo goes on sale for £19,995 from early next year. The Juke Nismo gains a body kit, and new-design 18-inch alloy wheels. An updated radiator grille and red door mirrors are Nismo features, which will be used in future models. Inside, suede sports seats and an Alcantara steering wheel add sportiness, while the black trim detailing and Nismo kick plates finish off the cosmetic makeover. The Juke Nismo's 1.6-litre turbocharged four-cylinder engine develops 200PS (197bhp) and it is available with either front- or four-wheel drive forms. Transmission options are six-speed manual and CVT automatic. Performance figures are 0-62mph in 7.8 seconds and a maximum speed of 134mph. Despite the increased performance over the standard 1.6-litre Juke DiG-T Tekna on which the Nismo model is based, fuel consumption and CO2 emissions remain the same at 40.9mpg and 159g/km. Chassis settings have been revised too, with 10 per cent stiffer springs and revised damper settings. The Juke Nismo is available in three colours: Storm White, Pearl Black and Blade Silver. 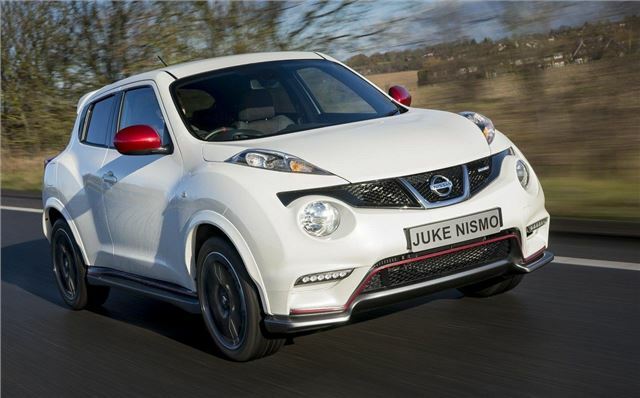 The Juke Nismo goes on sale in the UK in January, with deliveries commencing in March.